Summary: Kite-flying for fun and... fun. Notes: Written March & June, 2010. Feedback: Not necessary, but I certainly do like to get it! Cindy is one of my biggest fans, and I've just learned that flying a kite from her wheelchair is one of her fondest childhood memories. This story is dedicated to her. Jim paused on his way toward the door, his gym bag slung over his shoulder. "You sure you don't want to come, Chief?" "Thanks, Jim, but I have too much to do; once in a while, school has to take precedence." Blair used his red pen to scribble a note in the margin of the essay he was marking. "It's sunny and warm outside," Jim coaxed. "And a little time at the gym would help you keep up the next time we have to chase a perp." Blair snorted as he tossed the finished essay onto the coffee table and picked up the next. "You fill our 'running' quota just fine; I'll stick to using my brains and an occasional walking stick or baseball. Besides, anything under sixty-five degrees doesn't count as 'warm' --"
"Whimp!" Jim jeered. "It's only three degrees off, and it'll hit sixty-five in another hour." "-- and after I finish the grading, I have another project planned," Blair continued, ignoring his partner's interruption. Jim shrugged as he snagged his jacket from the hook beside the door. "Suit yourself. Just don't blame me when you turn decrepit from lack of exercise." "Keep tellin' yourself that," Blair retorted as he deliberately -- Jim was sure of it -- lifted his sock-clad feet to rest them on the coffee table. "It wasn't me who had to resort to using sentinel abilities to eke out the high score in our last basketball one-on-one." Jim wasn't going to dignify that slander with a response. "Okay, Chief. I'll be back in a few hours. Think I'll hit the market after the gym, save us a trip tomorrow." "-- is the way to go; gotcha." Jim closed the door behind him, leaving Blair immersed in academia. Jim manhandled the overfull grocery bags through the door -- why make two trips up the stairs if you could cut it down to one? -- and stared at the changes in his formerly pristine, orderly living room. The loveseat had been shoved aside, and the coffee table pushed up against the couch -- apparently to allow Blair to drag the dining table to a position in front of the balcony doors, where the shades had been raised to the top, to allow as much light as possible to enter. A frame of sticks and string lay on one end of the table, while an explosion of colored tissue-paper covered the other end, and the debris of bits and pieces littered the floor around the table like a meadow of wildflowers run rampant. Blair was engrossed in cutting several layers of deep-rose tissue into triangles. "Sandburg! What in the name of --"
Blair didn't so much as twitch. "Relax. It's just paper; I'll clean it up and move everything back when I'm finished." He laid the rose-colored triangles aside and started folding a piece of bright gold paper into quarters. "And the living room has been turned into a kindergarten art project because...?" Jim was wavering between irritation and amusement as he started putting the groceries away. In the year since Sandburg had moved into the spare room, his presence had made Jim's life fuller and more interesting. On the other hand -- Jim watched as a scrap of gold drifted down to the floor -- 'interesting' frequently had drawbacks. "The first day of Spring is next week." As an explanation, it didn't go far. "That would certainly explain the warmer temperatures," Jim agreed, "but not why the place looks like a tornado has passed through." "In some parts of the world, Spring is traditional kite-flying time. Some of the schools have got together and are hosting a kite-flying festival and contest next weekend. I thought I'd make a kite and join in the fun." Blair pulled the sticks-and-string framework closer and started arranging triangles, rectangles, and parallelograms of colored paper on top. "Wouldn't it be easier to just buy a kite? Certainly a lot less trouble." Jim wandered closer to watch as Blair moved the pieces of tissue around, apparently trying to devise a pattern he liked. The frame was made of flat strips of wood, three that were three feet long, and one that was four feet. They were carefully notched in the center and crossed over each other to form an eight-pointed starburst, with one arm that was a foot longer than the others. The sticks were grooved to hold four layers of string at regular intervals from the center to the one at the outer edge to hold the frame stable. The effect was that of a giant spider-web wearing a dunce-cap, and the farthest thing he could imagine from the traditional diamond-shape he thought of as 'kite'. "It doesn't look like it'll be stable enough to fly," he observed. "And what's with that extra-long piece?" "Mostly for effect; I'll put folded paper on that line, and it'll hum in the wind. You'll see -- with a good tail and the string attached at the right points for proper balance, it'll outfly most of the store-bought kites, which is a good enough reason to make it myself. But the point of the exercise..." Blair paused as he stepped back to judge the effect of his design. "The point of the exercise is fun and creativity, and buying a kite just isn't creative. Besides, mine will be prettier. What do you think?" "Well, there probably won't be another like it," Jim said, keeping his voice as neutral as possible. Somehow, all those bits of paper were laid out to form spirals in rose, gold, green and white. The spirals started in the center and curved around the kite till they reached the edge. The colors were pretty, but the effect was... loud. He suspected that Blair would consider it 'vibrant'. "That tissue paper won't stand up against the wind; get a few holes in it and it'll be bye-bye kite." Blair spread newspaper over the one clear spot on the table, transferred the kite-frame to it, and reached for the nearby bottle of Elmer's glue. "Nope. With separate pieces like this, and each side glued down, any tears will be localized. They can't spread to ruin the whole kite, and the other sections will keep it in the air." He put a line of glue along the sticks and string that formed one of the center triangles, and carefully pressed a gold piece of tissue onto it. "It'll dry tonight, and I'll give it a test flight tomorrow. You'll see." Jim snickered as he moved the coffee table so he could sit on the couch, then turned on the TV. "I'll see you head to the store after that thing crashes and burns. Just remember -- every speck of paper in the trash when you're finished." He settled in to watch some college basketball. "One of these days, Jim, you'll learn that my talents are many and varied." Blair's lofty tone was counteracted by his own snicker; his mouth quirked as he quietly began to sing, "Let's go fly a kite..."
Jim simply turned up the volume on the TV a couple of notches. Over waffles the next morning, Jim glanced at Blair's kite, which was leaning against the wall under the coathooks. "I'm impressed, Chief; it actually looks pretty good." Blair nodded in satisfaction. "It'll look even better in flight, with the sun lighting it -- like stained glass." "You're actually going to try to fly it?" "Absolutely! And there's no 'try'; it will fly. The weather forecast is perfect -- sunny, highs in the mid-seventies, winds from ten to fifteen. I've got a few more essays to grade; I figured I'd do them this morning, then go out after lunch, when it's nice and warm. Care to join me?" "Sandburg, I haven't flown a kite since I was eight!" Jim protested. "It's kind of a ridiculous activity for a grown man. On the other hand, I suppose you'll fit right in with the rest of the kids." Blair snorted. "Oh, sure. That's why the contest will have child, teen, and adult divisions; they want to have openings for all the adult men and women who won't be flying." His eyes sparkled as he issued a challenge. "Since you're so sure it won't fly, you need to come watch; I don't want you to think I'm exaggerating when I report my success." "Exaggerate? You? How could I possibly think that?" Jim studied his friend, noting the light of excitement and enthusiasm in Blair's eyes. Right now, he resembled a seven-year-old more than twenty-seven; it was a good look for him. Considering the schedule he maintained between Rainier and tagging along with Jim to help with his senses, Blair certainly deserved some downtime. Well, he really had nothing better to do, so why not? "Tell you what, buddy. We'll stop at Sports World on the way, and I'm buying the best kite they have in stock. We'll have our own little contest to see which kite flies better and higher. Loser buys dinner for the winner." "You're so on, man. Prepare your palate for dinner at Mama Louisa's, because winner gets to pick." Blair stood and carried his plate to the stove. "But in the meantime, I'm gonna cook another waffle; you want one?" A few minutes later, each man was sitting again at the table, pouring real maple syrup -- one of the perks of living this close to Canada -- over his waffles. Each took a share of the newspaper, and they settled into their normal, companionable Sunday morning routine. "Satisfactory, Chief?" Jim asked as he pulled into the nearly-empty parking lot overlooking Banbury Beach. "No electric wires, no kite-eating trees, and a good, steady onshore breeze." "Couldn't be better," Blair agreed. "There won't be many people around, since it's not warm enough for swimming." He slid out of the truck, and carefully pulled his kite from behind the seat, then waited patiently while Jim unfurled the big yellow-and-purple Delta kite, which the clerk at Sports World had assured them was the best flyer available. "Doesn't matter what that guy said," Blair commented as he watched Jim attach the string and tail. "You are going down, my man." "We'll see, Junior; we'll see." Side by side, they headed down the path toward the beach. "So, can I assume one of Naomi's boyfriends taught you to make your own kites?" Blair shared a wide grin with his friend. "You need to ask? I was eight, I think. His name was Tom Davidson, and he'd grown up in Bermuda. Kite-flying is a big deal there, starting in the Spring, and especially on Good Friday. Tom said everyone flies kites on Good Friday, and no one uses a store-bought kite. 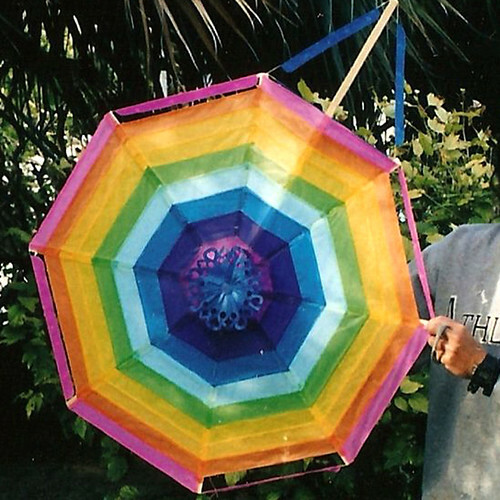 He said they even sell do-it-yourself books, teaching people how to make different styles of kites, but this one..." he lifted the kite in emphasis, "is the most common." "Sounds like you liked him," Jim said, as they reached the sand. "Yeah, I really did; he was a good guy." Blair shrugged. "But he didn't last long. Round about the middle of June, Naomi took us to the next wherever; I don't remember exactly which one." Jim kept his frown to himself. Even though Blair seemed to think his childhood had been exciting, and that it had given him a pleasant exposure to different lifestyles and cultures, Jim sometimes thought the kid had missed some very important aspects... things like stability, and having a trusted person always around. Sally had been that for Jim, but he suspected Blair hadn't had a similar constancy, even from his own mother. But this wasn't the time or place to compare childhoods; he was here to uphold the honor of precision-crafted materials assembled to exact specifications against homemade bits of string and paper. It would be no contest. Although the day was sunny, the wind coming off the water was cool; the beach was empty, save for a couple of fishermen sitting on an outcropping of rocks at the far end. They could use the full length of the sand without needing to maneuver around people enjoying the beach and ocean. Jim surveyed the expanse of sand. "How about you go that way a hundred yards or so, and I'll go this way a hundred, so we'll have enough room to fly without the kites interfering with each other." "Sounds like a plan," Blair agreed, and headed down the beach, his kite tugging gently in his hand, as if eager to be set free. When he judged he was far enough away, he turned to see Jim holding his kite at the ready. "Oh, we didn't plan this part," Blair said in a normal voice, sure that Jim would hear him. "I guess we should send off our kites at the same time, huh?" Jim raised his hand over his head in what Blair had to assume was assent. "Okay, give me a second." Blair turned his back to the wind, holding the kite so the wind was pushing against it, and made sure that both tail and string were free and untangled. He looked toward Jim. "Ready?" Again, Jim raised his arm overhead. "Okay, on three. One. Two. Three!" He tossed his kite gently into the air, taking a few running steps backward. The wind caught it immediately, lifting it upward as Blair played out the string, adding judicious tension to prevent it diving out of control. Blair had forgotten how thrilling it was to watch a kite that he had made with his own hands dancing on the wind. It dipped and soared, responding to each tug or release he gave the string, climbing higher and higher, seeming to aim for the sun. Time passed unnoticed as he became immersed in total sensation. Sound -- the buzz of the paper waving from the strings on the longer 'header' stick mixing with the rhythmic wash of waves retreating and advancing on the sand behind him and the screech of gulls in their eternal quest for food. Touch -- the warmth of the sun on this head and shoulders, the mild pulse of the wind against his back, the vibration of the string in his hands. Sight -- always, always the view of his kite playing in the sky, becoming increasingly smaller in his vision as it sought escape from the bonds of earth and gravity. Finally, Blair had to stop paying out the line, or lose sight of his kite altogether. He felt a flash of envy -- not for the first time -- for Jim's senses. Jim would always see his kite, no matter how far it flew. Jim -- distance -- they were supposed to be having a contest here, but he'd completely forgotten to keep an eye on Jim's kite. Blair searched the sky, and finally located a purple-and-yellow blot in the sky, about the size of a postage stamp. Pretty much the same apparent size as his kite; they seemed to be flying equally well, and there was no way to tell if one was higher than the other, especially from this angle. Maybe if he were closer to Jim's position, he could make a better evaluation. Accordingly, Blair started to move toward Jim, now keeping an eye on the kites' relative locations; if one kite got caught in the string of the other, it would bring their impromptu 'contest' to a screeching halt. But the wind was steady, without the variable gusts that would cause erratic flight; it should be safe enough. He stopped about seventy-five feet from Jim; close enough to view the kites from essentially the same angle, far enough that they shouldn't cross each other. Blair spent a few minutes refining his tension on the line, making sure his kite continued to fly high, then focused on both kites to judge if there was any difference. He couldn't see anything that would give one kite precedence over the other. Both were flying steady and true, without needing any frantic attempts to prevent them plummeting toward earth, and... nope. He honestly couldn't say that one looked higher than the other. "So what d'ya think?" he asked Jim, still in at a normal volume. "They look the same to me; how about you?" "You're right, Chief!" Jim raised his voice to travel the distance. "I think it's a draw!" Blair nodded. "Good enough for me. Shall we bring 'em in?" He started winding the line around the reel -- carefully. If his kite fell on the way down, he could still lose this contest. The trick was a smooth, controlled action, to keep his kite flying until he could reach up and grab it. Jim was using the same controlled economy of motion; for a guy who hadn't flown a kite since he was eight, he sure hadn't lost the touch. Of course, it had been more than a few years since Blair had put a kite in the air, and he hadn't had any trouble. Must be like riding a bike; once learned, never forgotten. As the kites came closer, another -- unspoken -- contest developed; could they keep their kites flying at the same height and bring them in together? Blair snickered when he realized what was going on, and Jim flashed him a grin, but both men kept an eye on the kites and each other until -- finally -- they reached out and plucked their kites out of the air at the same time. Blair whooped. "Couldn't have done that better if we tried!" "We did try," Jim pointed out, his tone dry. "And I don't think they pass out any awards for synchronized kite-flying." "So you don't think we can start a trend?" Blair pulled a mock pout. "And here I was hoping to make the Guinness Book of World Records." "I think you'll have to settle for greatest sentinel expert -- when we're both old and gray, of course." Jim turned to start back to the truck, and Blair fell into step beside him. "I'll be gray; you'll be bald. But it sounds like a plan." As they stowed their kites behind the seats and climbed into the truck, Blair asked, "So, since neither one of us won -- or we both did -- how will we handle dinner?" "I think Mama Louisa's was a good idea. The only difference is, we each pay for our own meal." "So, pretty much as usual." Just before he turned onto the main road into the city, Jim added, "Except for the kite-flying. That was kind of special. Thanks, Chief." Blair smiled as he turned to watch the passing scenery. What was 'special' was their friendship. Flying kites, or fishing, or chasing after perps... at the end of the day, that never changed. He hoped it never would. Posted under a Creative Commons license from Aodhdubh. Colorful Delta kite in sky. 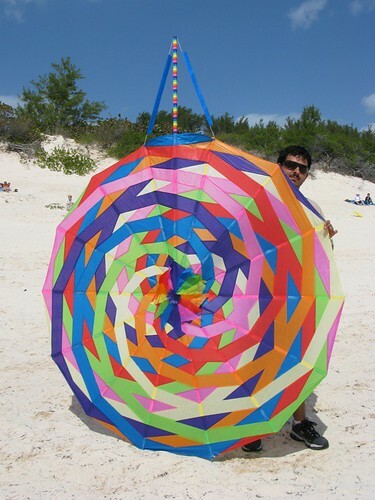 Bermuda kite history, with picture of spiral design on kite. Yellow and green triangles, with central floral design. Varicolored spiral design on beach. Purple and blue starburst design on beach. Small starburst design with rainbow swirls on beach. Large multicolored rainbow swirl design on beach. Large geometric varicolored triangle design on beach. Directions for making various types of kites. Good site, with history and photo gallery. Directions for making the hexagonal kite. Directions for making the high-flyer kite #1.